Over the years of blogging I have met many great people that have become my friends. It is an amazing journey. I received an award from Leanne today, thank you! Leanne is also becoming a contributor on my other blog Going Green Crafter's And Artists so stop by and visit to see all of our contributors works. 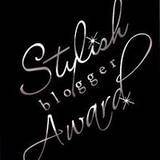 There is a catch to this award......I get to pass it on to 8 other new blogging friends I've met! Here's my award from Leanne and the rules to accept it. Easy peasy......here's my 8 random facts. No laughing! 3. I order all of my drinks from McDonalds with extra ice. I don't think the 3 cubes they give you are enough. 6. I mix downy softener with a little bit of water and have it in a spray bottle. Every morning while making the bed I spray the sheets so that each night I get into bed it smells like I just did laundry. My Niece and her blog about her wonderful life. Congrats on your award, Monica! I get such a kick out of these! And, no wonder I am pulled to you and your talent! We have tooo many things in common! Karen Carpenter was my all time fav in school and I think I have sung every song she recorded at one time or another! I love the idea of the Downy spray! Have a great weekend! Blessings to you!